Author Steve Slack covered the trial of Atty. Gen. William J. Scott and interviewed many of those involved. What follows is the denouement of a long and paradoxical story. Robert Kieckhefer wrote of Scott's achievements as attorney general and of his impending problems with the law in the October 1978 Illinois Issues. THEY HAD TROUBLE finding a piano player for the evening's bash, somebody willing to brave a wicked winter night to play a political gig in the splendid red ballroom of the Bismarck Hotel. At the last minute they coaxed away a young musician from a Loop cocktail lounge who came armed with two-hours worth of show tunes, including the hit song from "Annie" called "Tomorrow." 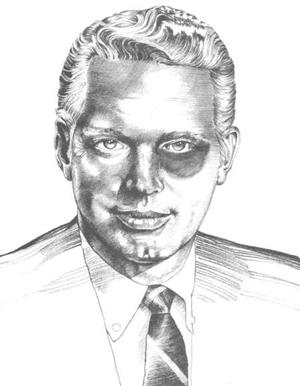 That particular tomorrow, January 8, 1980, William J. Scott — the evening's honored guest, the attorney general of the state of Illinois, shoo-in Republican candidate for United States Senator, battling Galahad for clean air, water and earth — would go on trial as a tax cheat. "Politics," snarled one of Scott's allies above the lilting music, "is the last of the blood sports." Then he finished his drink. Bill Scott doesn't drink. Nor does he smoke. It was alleged he had other vices, indelicately detailed during his trial. Women, for one. Money, for another. Bill Scott's women are nobody's business but Bill Scott's. His money, however, became the interest of the federal government, mainly because it was suspected he spent far more of it than showed up on his Form 1040. Ergo, some of that money belonged to the federal government as taxes. And if Scott hadn't bothered to tell them about his extra-curricular income — why then, every April 15, at midnight, for five years, Illinois' chief legal officer became a knowing, willful felon. A common thief. The very idea made Bill Scott bristle. The mention of it made his azure blue eyes glint with rage, brought the blood to his fine Swedish face. He'd thrust that face close to yours, bare his tiny teeth and spit: "They haven't got a thing. So they're going to make a soap opera out of it." The government called this drama "The Secret Life of William Scott." And it was to begin . . . tomorrow. in action. "I never saw anything take like that," said his sister, Jean. "He just came back waving a flag. And he was just a kid. He lives, eats, breathes politics. Really. We thought when he was young, we'd have to get him a room at the LaSalle [Hotel]. He was always downtown working for somebody." If his family ever questioned the time he spent downtown stuffing envelopes or manning a phone bank, he'd tell them, "You may as well ask me to stop breathing." Scott enlisted in the United States Air Corps during World War II and returned to go to law school. He graduated from Chicago-Kent College of Law in 1950. He went into banking, then quit to work as a special assistant in the U.S. Attorney's office in Chicago. As part of the U.S. attorney's learn, Scott and a squad of fiesty young bloods were put in charge of leaning up the vice-riddled south suburbs. Those were good days. He made friends, chased the strippers and gamblers out of town and . . . made enemies. The Syndicate. Bill Scott's paranoia about the Syndicate, whether merited or not, clouded his thoughts, especially during his trial. He was convinced that he was on somebody's hit list. His insistence that the tax-fraud trial was somehow the result of an alliance between organized crime, giant industrial polluters and the federal government sounded so perverse, one had to wonder if perhaps it were true. But these were the good days. After the clean-up operation, Scott went back to banking, though he hankered for more of politics. In 1962, Scott came to Springfield, a slender, boyish-looking 35-year-old who had never held public office. He came down with an armload of petitions qualifying him as a candidate for the Republican nomination as Illinois state treasurer. His opponent was the highly respected state representative from Oak Park, Harold Reum. Reum had the backing of the then-powerful secretary of state, Charles Carpentier. But Scott had managed to get some surprising help from Elmer Hoffman, DuPage County GOP padrone, and with Hoffman's muscle beat Reum by 33,000 votes. He went on to upset Democrat Francis Lorenz by 55,000 votes. Scott wasn't a natural campaigner. He didn't have the glad hands of Alan Dixon. He didn't have the competent authority of a Thompson nor the cerebral acumen of a Stevenson. Scott was a loner. He sensed wisely and rightly that he'd need to establish a superlative record in office. He also knew what a few well-placed friends and a talented staff could do, and he set about finding both. Scott did what a state treasurer had to do to build a record — he made money for the state. He made a lot of money for the state. During his tenure, the treasury ballooned with interest income. He didn't miss a chance to boast about it. Ambition consumed him. After two years he was hungry to be governor, and did not hesitate to make his desires known. It was an ill-advised move. State Republican leaders did not admire his cheek, nor did they like the way he preferred to go it alone. They wanted a team player, they wanted someone attractive, someone with fire, brains and some tact. They wanted Chuck Percy, then a young chief executive officer with Bell and Howell. They got him, and they got beat with him. Scott shrugged it off. He went on to serve an unprecedented four terms as the state's attorney general, trouncing Lorenz again in 1968, smothering Tom Lyons in 1972, Cecil Partee in 1976 and Richard Troy in 1978. He became the state's all-time top vote getter and he continued to do it his own way, a king of hearts who refused to shuffle with the rest of the GOP deck. What he lacked in party loyalty, he made up for in political prowess. He saw the environmental awareness movement coming and rode its crest. He restructured the attorney general's office to put it in the forefront of politically popular causes — environmentalism and consumerism. An inarticulate speaker, he stuck with building a record that could speak for itself. He leveled lawsuits against the city of Milwaukee and U.S. Steel to clean up Lake Michigan. He pressured the cities of Kenosha and Racine, Wisc. to build new waste treatment plants for sewage headed into the Lake. In 1976 he forced Inland Steel to install a new filtration system at its East Chicago mill in Indiana, a filtration system that would be the largest in the country. Bill Scott liked big cases, mammoth cases, cases that made for good press releases and magnificent campaign slogans. He got a $34 million settlement (later overturned) from General Motors in the case of the switched engines — accusing the company of putting Chevrolet motors in 1977 Oldsmobiles. He successfully prosecuted those responsible for the Equity Insurance fraud scandal — a scam in which $2 billion worth of phony insurance policies were created. He pushed through a revision of the state's Consumer Fraud Act and beefed up the consumer fraud and protection divisions of his office. "He'd sue anybody," said a former member of his Springfield office. "You'd walk in and say, 'I want to sue so-and-so.' He'd ask, 'Can you win it?' And that was it." But now he was at the Bismarck waiting for tomorrow. "I'm going to win that suit, just like I'm going to win that election," Scott promised the party-goers before they spun out the door and into the night. His daughter, Lisa, kissed him goodnight and went home to her school-books. His mother hugged him and left. His wife, a beautiful honey-blonde, waited impatiently. "If Jean [Scott's sister] hadn't had heart surgery like mine, I probably never would have gone through with it. I'd have been too afraid. But I'm glad I did. Actually, we got it before it was a heart attack. I'm even better than I was before. "It sure puts things in perspective. There's no question that when you come that close and God spares you, there's a reason. There are many things still to be done. Nothing puts it in focus like knowing you've got a limited time on earth." He glanced at his watch, startled, and abruptly began getting ready to leave. He still had a four-or-five-hour session with his lawyers. And it was already tomorrow. Politics and law in Illinois are so incestuously entwined that irony came in spades throughout the trial of Bill Scott. To him, the most ironic aspect of the case was simply that it was to be tried in the building named to honor his political mentor, Everett Dirksen. He walked into the Dirksen Building and into a courtroom packed to the corners. The curious stood on tip-toes outside the big double doors and peered through the windows trying to get a glimpse of the bantam-weight Bill Scott. The garrulous old men who while away their days in the dry heat of the sterile courthouse corridors bickered among themselves for the best seats. The nation's finest state attorney general came to trial in what, at times, appeared to be a three-penny opera. In his chambers, Federal Judge John Powers Crowley prepared to hear case 79 CR 236 — The United States v. William J. Scott. Only 43 years old, Crowley has a sterling reputation among his colleagues. On the bench for only four years, he was given the highest rating of any federal judge by the Chicago Council of Lawyers. Often severe with lawyers, he is sometimes benign, almost patronizing to jurors. Crowley took his seat and faced two battalions of the finest legal minds in the state. Chief for the defense, William Barnett. Himself a former member of the U.S. Attorney's office, Barnett is known as one of Chicago's leading defense men and a specialist in tax and anti-trust cases. Following his graduation from Loyola University Law School, Barnett became district counsel for the Internal Revenue Service in Detroit and then joined the U.S. Attorney's office in Chicago to head the criminal tax division. Tall, dapper, low key, Barnett, along with his assistant, Gerald Risner, defended former Gov. William Stratton on charges similar to Scott's. Stratton was acquitted. In contrast to Barnett was his second-in-command, the flamboyant, fiery, forensic titan, Vincent Bugliosi. Bugliosi, 44, a former Los Angeles district attorney, rose to fame as the man who convicted Charles Manson and his "family" and co-authored the ghoulish account of the trial, Helter-Skelter. Bugliosi, somewhat prone to brag, claims to have prosecuted 1,000 cases during his tenure as state's attorney — and to have lost only one. He is legendary for his slick summations and was hired at the last minute specifically to give Scott's final plea. "I'd never heard of Scott when he called me," Bugliosi said. "So I met with him at my home and checked around and saw he really did go after those polluters and people like that. He knew me, knew of my abilities as a lawyer, knew that I was interested in the things he had fought for in Illinois. It wasn't decided I'd be on the case until January 3. The understanding was that I would handle the summation and handle Bill on the witness stand. "I'm not a lawyer," he joked. "I'm a showman." Also at the defense table was David Lichtenstein, a former member of the Illinois attorney general's office, now working with Barnett. In his capacity as assistant attorney general, Lichtenstein represented the state in disputes over subpoenas in the Scott case. Scott's nemesis, the man he vilified with almost every breath, Thomas P. Sullivan, sat a few feet away. Sullivan was named chief federal prosecutor in 1977. He had made his reputation as a top-notch defense lawyer and had been a partner in the prestigious law firm of Jenner and Block since 1963. A tough and meticulous trial lawyer, Sullivan prosecuted five cases before the Scott trial and won them all. Sullivan's association with Jenner and Block peeved Scott because the firm had represented defendents in suits brought by Scott's office. Sullivan never actually represented any of the defendents himself, but Scott insisted that the association with the law firm tainted the patrician-like prosecutor. Standing with Sullivan was Jeremy Margolis, a theatrical wonder-boy who, at 32, led the 18-month grand jury investigation into Scott's finances, defeated repeated attempts to have the probe stopped and was said to have committed to memory every piece of evidence in the case — hundreds of documents. The third man on the prosecution team was Scott Turow, 30 years old, a Harvard Law School graduate and the author of the best-selling book One L, an account of his first year at law school. All this was a potent batch of legal wizardry dumped into the laps of 12 of Bill Scott's peers. For a jury he got a heavy equipment operator, a suburban energy consultant, a Sears home-improvement salesman, a mechanic, a bookkeeper, a water filtration engineer, a mechanic for the City of Chicago, a photographer's technician, a bricklayer, a police department clerk, a farmer and a cost analyst for Zenith. Ten men, two women. Eight with a high school diploma, two with some college education. One with a master's degree, one who finished the seventh grade. They raised their right hands and swore to God to give Bill Scott justice. On November 8, 1967, Dorothy Humphrey Scott, first wife of the attorney general, went to the Harris Bank in Chicago looking for a legal document in the Scott's joint safe deposit box. What she was "shocked and stunned" to find was a stash of cash. returned the box to the officer of the bank and left. I was shaken." She said she returned later in the day, opened a new box at the Northern Trust Bank in her name only and transferred the envelopes to that safety deposit box. A few days later she said she went to another safe deposit box at the Evan-ston Trust and Savings Bank. "I did not find the document again, but I found an envelope. I opened it, I looked inside and there was cash money and notations on the outside of the envelope." This, the allegedly startled Mrs. Scott took home and put in a refrigerator. Later, this envelope ended up with the others in a private security box at the Northern Trust. Days later Bill Scott came home in a rage. What had she done with the money? he demanded. "It was a difficult time," recalled Dorothy Humphrey. He was very upset. I was very upset. I asked him what the envelopes represented, and he told me that they were campaign funds. I asked him where they had come from, and he said they were campaign funds and not for personal use." Three years later, the Scott's were divorced. The former Mrs. Scott said the envelopes were an issue between them in the strained days before their divorce. In the meantime, Dorothy Humphrey moved the money again, this time to the State Bank of Evanston and, in the process, made a list of some of the bills in the envelopes, including the serial numbers of six $500 bills in one envelope and the total from the Harris bank box of $39,900. Humphrey continued to refuse Scott's request to hand over the cash until their divorce settlement. At that time, Scott declared the funds to be political campaign contributions, unavailable for personal use, and won the rights to the money. Seven years later, Ed Pound, an investigative reporter for the Chicago Sun-Times, alerted by disclosure of the cash in a child support hearing, revealed to the public that Scott had $50,000 tucked away in safe deposit boxes in Chicago and Evanston. This disclosure sparked a grand jury investigation that culminated on April 19, 1979 in an indictment returned against Bill Scott. In order to prove that Scott used political campaign money for personal use, the prosecution had to meticulously piece together his income and expenditures. It used as a reference point a letter the attorney general sent to his wife detailing his net worth prior to the divorce. The state's case was difficult to prove because Scott operated almost exclusively in cash. IRS investigators gathered together mounds of airline tickets, rent-a-car receipts, hotel bills — retracing as best they could, Bill Scott's life for 13 years. What spurred them on, convinced them that they had a case, was that there were very few, incredibly few, checks written for cash. And the paychecks Bill Scott got for his job representing the people of Illinois were nearly all expended immediately to pay for child support. The investigators were convinced that the only place Scott could have gotten the money to live as well as he did was from his various safe deposit boxes brimming with campaign cash. No, Scott said. In a last grasp to avoid indictment, Scott's attorney sent a letter to the U.S. Justice Department asking for a review of the case. He claimed Scott had other sources of nontaxable income. He said he employees would give him gifts — at Christmas and on his birthday. He said that the attorney general's office had a special "host fund" which paid for trips Scott took as official business. He said that Scott had investments that generated outside income. "Tissue of lies," said Sullivan of the defense letter. "Total and complete fabrication." In the letter to the Department of Justice, Scott also stated that he was the head of a Chicago travel agency and the primary salesman until February of 1975 and was therefore entitled to reduced air fair privileges that would have allowed him to do much of his traveling at a discount rate. (Later testimony showed, however, that Scott was denied special status because it was learned he was the state's attorney general and therefore not employed chiefly as a travel agent). Scott listed 115 people in the letter as gift-giving friends who passed small amounts of money to him. During the trial, however, a number of men testified that they had given Scott huge sums of money. Curiously, many of the contributors also turned out to be special assistant attorneys general, given state business under Scott's administration. "The money they gave was either political campaign contributions or it is money obtained from special assistants, which smacks very strongly of a bribe," Sullivan charged. Officially, Bill Scott was never charged with bribery. He was never strongly accused of any kind of official misconduct. With the exception of some minor incidents in which it appeared that he had double-billed the state for travel expenses, no one ever said he used his office to steal from state coffers. The prosecution strongly hinted that the folks who pressed cash into Scott's palm, folks who sometimes literally stuffed it into his coat pockets, felt the unspoken pressure of a powerful man on their wallets. But nobody admitted to that. The government built its case like a matchstick castle, tediously framing a structure that would imprison the attorney general and leave not the smallest chink for escape. Sullivan went deep into the pool of Scott friends, associates and acquaintances, fishing out reluctant witnesses. "I first heard about [the safe deposit stash] on the radio," said Robert Johnson, Scott's accountant, admitting that he thought Scott was telling him everything about his campaign funds. An employee of First Federal Saving and Loan of Chicago told the jurors that a $500 check marked "for campaign use" was actually deposited in Scott's personal account. An official responsible for keeping a ledger of Scott's political contributions recalled very little cash coming to him and every dime that did going into Scott's supervised campaign account. a probate concern intricately involved with the attorney general's office, said he gave Scott a cashier's check for $2,500 made out to the Citizens for William J. Scott for Public Office Committee. The check was used to purchase a $5,000 U.S. Treasury note. Maiden Jones, a talkative former newspaper reporter from Springfield, told how he sold Scott a stamp album in 1972 for $2,600, Scott paying the bulk of it in cash. Cook County Judge Reginald Holzer gave an embarrassing account of how Scott once came to him claiming to be in penury. Scott allegedly took trips to Jamaica and Europe with a young $120-a-week receptionist and moved into an expensive Lakefront apartment at the same time he was claiming to be broke and gratefully accepting cash from friends. An internal revenue agent reviewed Scott's declared income and concluded he didn't have enough money to put up nearly $50,000 in personal contributions to his 1964 and 1969 campaigns as Scott claimed. Another technical advisor for the IRS concluded Scott underreported his income by $52,000 and called that "just the tip of the iceberg." Chicago real estate tycoon and sports magnate Arthur Wirtz admitted that he had once hired Scott as an attorney, paying him $27,000 and later hired his then-girlfriend Ellen Cooper for $23,000 even though he could find no records of either of them ever doing anything to earn the money. Cooper, in fact, was shown to be working at that time in Scott's campaign. Her salary, Sullivan argued, was "earned" by Bill Scott and it was he who should have paid taxes on it. One hundred witnesses were lined up to testify on Scott's behalf. The defense intended to march them through in a parade, each one proudly announcing how much cash they'd doled out to the attorney general simply because they liked him. There was William Stewart, GOP honcho from Chicago: "I'd reach into my pocket and say 'This here's a little something for you, Scotty, from Bill.'" There was Carl Epstein, a Chicago surgeon: "We'd have lunch, or I'd see him on the street and we'd have a Coca-Cola or something ... I'd give him $100 to $150 each time." And then there was restauranteur Louis Katsauras who said he fed Bill Scott for free because "It's good business," and Gordon Colsen, the president of a Paris, Illinois, printing plant who gave him $300 to $400 and never said anything but "Here." The only problem was that many of the eager witnesses had given the unrestricted cash at political functions or had other reasons for wanting to keep Bill Scott in office. One was Edward Barrett. Barrett, along with his law partner, William Kiley, were special assistant attorneys general. In 1972, Barrett said, he called Scott and told him he wanted to give Scott money "for expenses in the campaign." Scott allegedly told him he'd pick up the money personally and went to the law office where the lawyers had two envelopes, each containing $2,500. "We told Bill how grateful we were for the — for the business that we had gotten from the state and we wanted to contribute to his campaign fund, knowing that it's an election year coming up, and we figured he could use it," Barrett testified. Scott took the money, put it in his pocket and thanked him. "Don't forget where you got that," Barrett answered. The money never showed up in campaign records and Barrett refused to budge on his contention that the $5,000 was strictly for campaign use. "That was a big bullet to bite," Cur-ley Brown, one of the jurors told newspaper reporters after the trial. "We could at no time find evidence that Scott turned that money over to his campaign. Every time we'd start digging to try to find innocence, you'd find a hole instead. The more you dug, the deeper it got. We didn't want to railroad nobody nowhere." Edward Barrett had put the noose around Scott's neck. Case No. 79 CR 236 went to the jury just days before the primary election that could have given the attorney general the Republican nomination for the United States Senate. Scott decided not to testify and decided to scrap the testimony of his many influential character witnesses in order to get a verdict before the election. It went to the jury after marathon final summations, Bugliosi earning his salary with an eight-and-a-half hour tirade that left him so exhausted he went back to the office and fell upon a couch. "We find the defendent guilty of count one of the indictment, not guilty of counts 2,3,4,5." Barring a successful appeal, the career of Bill Scott ended just like that. Ended with the sobbing rage of his wife. Ended with the almost inaudible protestations of the attorney general himself. It was an end in which greed overcame principle, in which another Illinois official snuffed out the light of his own brilliant career because he could not abide by the oh-so-stringent demands of public servitude. "Make way for the candidate!" Steve Slack is a reporter for The State Journal-Register, Springfield.